I hate overly praising a game. I don’t feel any game is perfect. However, every once in a while a game comes along that bests all those that have come before it. 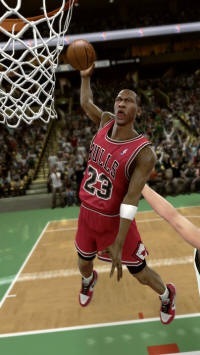 World of Warcraft, the original Half Life, and now, NBA 2K11. This is the best basketball game in at least 10 years, and a must buy for all those who enjoy digital roundball. Right off the bat you’re thrown into the fire. When you boot up the game for the first time you find yourself following Michael Jordan onto the court for game one of the 1991 NBA Finals against the Los Angeles Lakers. Facing James Worthy, Vlade Divac and Magic Johnson with Scottie Pippen, John Paxson and Bill Cartwright by your side on the old Chicago Stadium floor is enough to give a basketball fan chills. It doesn’t stop there, either. There are nine other great moments in Michael Jordan’s career for you to try and replicate in the Jordan Challenge mode. You can go for six threes in the first half against the Trailblazers for The Shrug, or for 69 points against Mark Price, Brad Daugherty and the Cleveland Cavaliers to match Jordan’s career high game (something my Dad witnessed in person, actually). The teams, the players, the courts, the commentary, they all add up to massive nostalgia for anyone who was following the game during His Airness’ reign. All it needs is a game that plays as good as the concept is sound. 2K Sports delivered on that front with aplomb. This is. bar none, the best playing basketball game since at least NBA Live 2000, and easily has the most realistic control and feel. Nothing feels out of place and if you practice, you can pull off just about any move you could ever want on the court. Players have a solid weight and sense of momentum that feels somewhat more well balanced then previous efforts. Running speeds seem toned down for a more believable pace to the game. The AI is also improved greatly. They shift on defense and make proper switches to cut off driving and passing lanes. On offense the AI is very quick to respond to mistakes you make (almost too quick) and plays smart, not hurting itself with stupid moves. Players going out of bounds at random and constant three-seconds in the paint penalties are all but gone. One thing I like about the play is that bad passes aren’t instantly secured. Sometimes the receiving player will bobble the pass, giving the defense a chance to steal the ball and adding a second of hesitation to secure the ball before you can make your next move – a nice touch. The Association is back and plays very well, with sound trading AI (three-team trades, everyone!) . The NBA.com screen is nice, with six pictures of current events, but some are repeated or just plain off. For example, there’s one picture of a player at the podium for an interview used for player announcements like retirements that I saw six times in the first month or so of my season, each time with a different player. Same scene, same pose, just a different player model. My Player is my favorite mode, and 2K Sports made some good improvements to it this year. The new grading scale is still a little stingy, but now gives you credit for passes leading to fouls, screens that lead to scores, and passes that lead to assists, so being a team player is more rewarding then last year. You can also get switched onto another man on defense and that player will be who you have to stop from scoring. No more getting dinged because you had to make a switch on defense and someone else let your man score. Hooray! The bar beneath your rating also gives you a better feel for how your actions reflect on your rating. The same box also displays your pertinent stats at the moment, such as points, blocks, shooting percentage, and more. After NBA games you can wind up in a post-game interview where you get to answer a question to affect your teammates opinion of you as well as the local and national fan bases. To me it seems a little random, with the grades going up or down when I’d assume they’d go the other way. You want to improve your publicity because it can lead to endorsements and Jordan shoe contracts, and you want to keep your teammates on your side or they’ll freeze you out of the game – not fun. The game looks really, really good on the court, but I’ve found foibles in the crowd shots, especially upper deck ones. The default camera presents a very good broadcast look and feel, and combined with player shots, well done highlights and the aforementioned crowd shots (something I’d never have thought of including, but they are in most every TV broadcast, so it’s a nice touch) you can really feel like you’re watching a real game. The NBA Today feature allows them to update scores, promote upcoming games during breaks and give you a league-wide update during the new-and-improved halftime show. The commentary is also the best it’s every been. not be getting drafted at all, let alone to start the 2nd round. Flaws and all, though, this is the best basketball game I’ve ever played. Please, if you like videogame basketball – even if you were a die-hard NBA Live fan who’s never touched a game in the 2K series – you owe it to yourself to play this game. Alphasim out.